This is part six of a seven-part series on state trends we’re watching in 2019. The rapid pace of change is showing no sign of slowing. MAINE and MICHIGAN have each legalized taxable sales of recreational cannabis and expect to see their first tax dollars flowing in the next couple years. Meanwhile, the governors of CONNECTICUT, ILLINOIS, NEW JERSEY, NEW YORK and RHODE ISLAND all support legalization and taxation of recreational cannabis, along with at least some legislators in states such as DELAWARE, MINNESOTA, NEW MEXICO and VERMONT, to name a few. 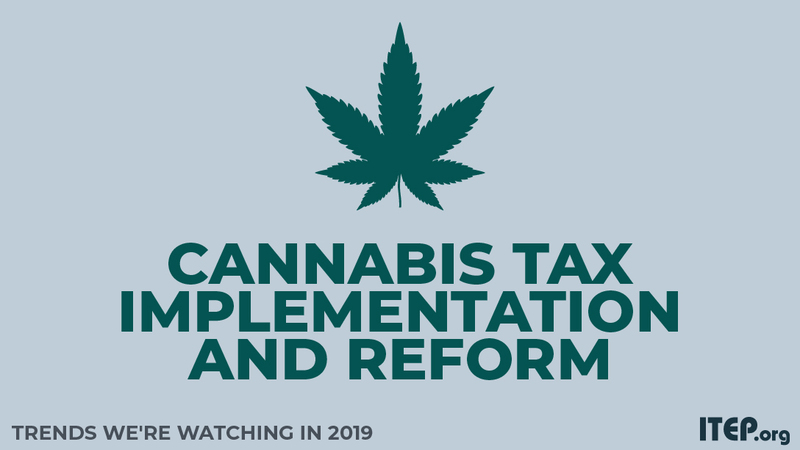 Looking ahead, ITEP cautions states to prepare for falling cannabis prices when setting up their tax structures. As the legal barriers surrounding cannabis are lowered or eliminated, the cost of this product will fall substantially, with major revenue implications for any state choosing to tax cannabis based on its price. For this reason, states such as ALASKA, CALIFORNIA, and MAINE have taken the sensible step of taxing cannabis based wholly or partly on its weight. The governors of NEW YORK and RHODE ISLAND each proposed similar tax structures in the budgets they unveiled this year.